Most LGBITQ relationships are built on love and respect. Some relationships however, are built on abuse and control. When a partner or ex-partner tries to manipulate, control or dominate the other this is domestic and family violence. The misuse of power and control can happen in any type of relationship and take many forms. 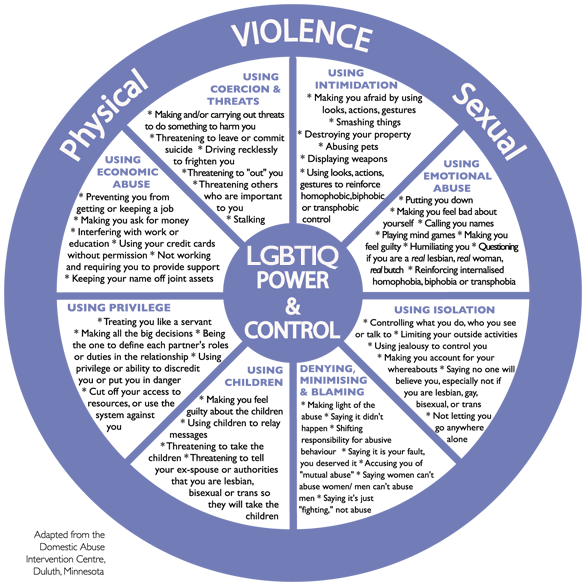 Such forms include emotional and psychological abuse, social isolation, financial control, physical violence and sexual assault. Service providers take domestic violence in these relationships very seriously and treat those subjected to this type of abuse with respect and ensure that their confidentiality is respected.